Next up in the gift guide we have one of my favorite books of the year, another gem from Yoe Books, in fact. 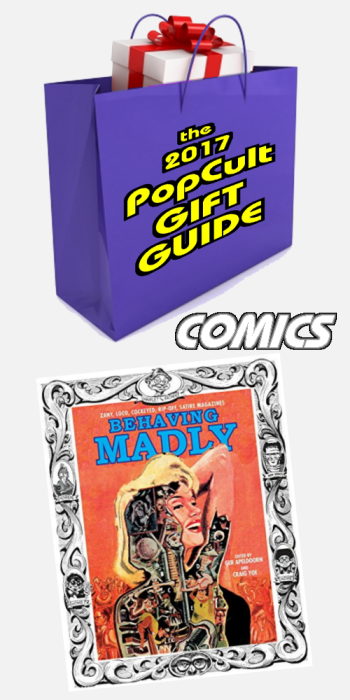 Behaving Madly is a collection of work taken from the many imitators of Mad Magazine that began springing up following the massive sucess of MAD after it was converted from a comic book into a magazine. Apeldoorn has written extensively about the books of this period and, together with Yoe, has crafted a detailed look at the best of the also-rans, which might not be a fair way to describe this book. After all, with 200 pages of never reprinted material by comic book legends Bill Elder, Jack Davis, John Severin, Al Jaffee, Joe Maneely, Jack Kirby, Ross Andru, Joe Kubert, Russ Heath, Bob Powell, Howard Nostrand, Basil Wolverton, Steve Ditko, Lee Elias, and many others, Behaving Madly is a pure treasure trove of unexpected delights. Behaving Madly shows off the versitility of some of the greatest artists who ever worked in comic books. We knew that the Mad Magazine artists like Davis, Wolverton, Elder and Jaffee could do great humor work, but who would have expected Jack Kirby, Joe Kubert, Russ Heath and Steve Ditko to have such an accomplished manic side (okay, we knew Kirby could be funny, but his art here is revelatory)? For fans of sick humor, parody, and mid-century mayhem, Behaving Madly is a gold mine. It works both as an historical document of a time when the comic book industry was struggling and top talent was looking for new avenues to earn a living, and also as a collection of very entertaining, very funny, humor comics from a legendary time. Behaving Madly can be ordered from any bookstore using the ISBN code above.